I’ve been implementing external login providers for the Humanitarian Toolbox’s AllReady humanitarian and disaster response open source project. I’ve already blogged about a mishap I had with User Secrets and a deep-dive on how to get email and name from Twitter’s external login provider. In this blog post, I want to show the design and implementation changes I made to the surrounding codebase while implementing each of the external login providers. I’ll show you how I started with switch statements in a controller action method, slowly refactored to decompose, encapsulate and abstract the implementation of the different external login providers, and finally, how I wired it all up using the factory design pattern and Autofac. 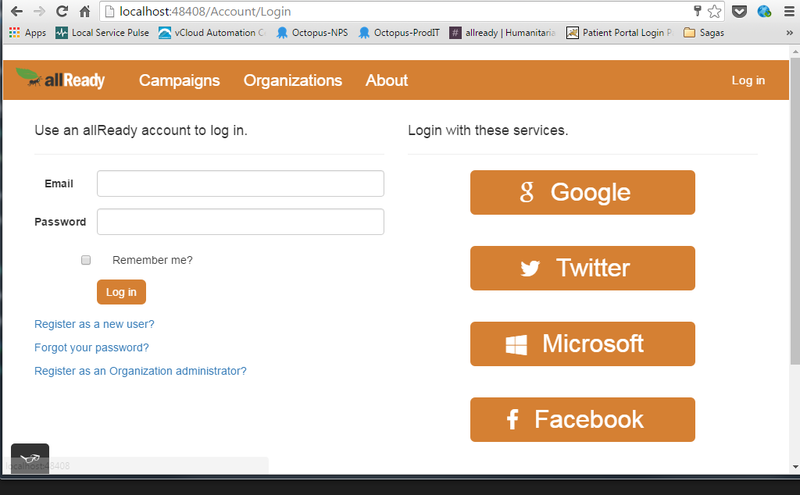 Clicking on any of the service logins will result in a request to the ExternalLogin action method. 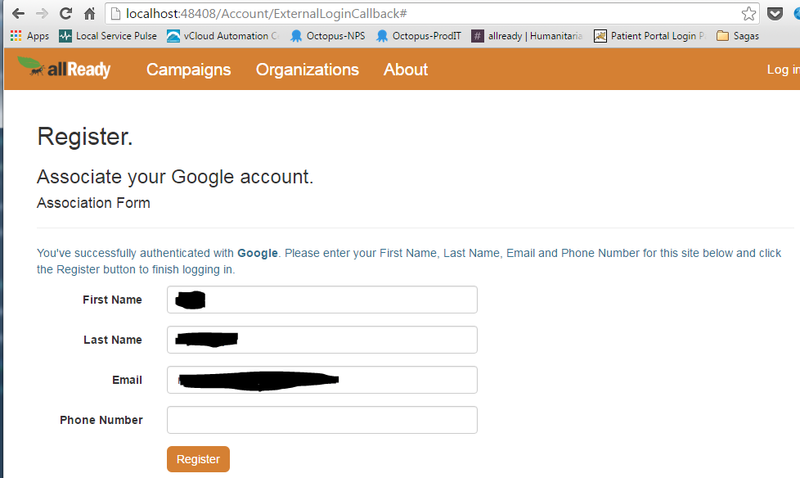 The ExternalLogin action method then redirects to the ExternalLoginCallback action method, which depending on the external login provider you picked on the login screen, will attempt to populate four pieces of information that are required to register with the AllReady site. This page will attempt to fill in those fields depending on the external login provider that has been picked. I would need to add another “if” block for each external login provider we wanted to add in the future. Seeing how this violated SRPand OCP, I immediately started to think how I could abstract away the retrieval of the needed values for each different external login provider from from the ExternalLoginCallback action method. A factory was the first thing that came to mind. Who doesn’t love the Factory pattern? It’s been around for ages, it’s one of the most easily understood design patterns out there and this scenario fit the usage well. To implement the factory, I needed a contract I could use across external login providers to retrieve email, first name and last name, the factory class itself and the code in the factory class that would create the appropriate external login provider for the provider’s name. ExternalUserInformation is a “DTO” that will contain the information the UI needs. Now I needed to break out each external login provider implementation (currently sitting in the ExternalLoginCallback action method as conditional statements) into a separate class that implements IProvideExternalUserInformation. I have one class that will retrieve the needed information for both Microsoft and Facebook, because these two providers work the exact same way. The factory itself implements an interface, IExternalUserInformationProviderFactory. Lastly, I registered the factory with ASP.NET Core’s built-in container in Startup.cs as a singleton so it could be injected into AccountController at run-time. I ran the code and it worked. All was right with the world, until I had to finish implementing the Twitter external login provider. At this point in the refactoring, I was still in the process of figuring out/finalizing the Twitter provider. I won’t show you the whole provider here (you can check it out directly on AllReady’s GitHub), but the provider needed four pieces of information that were being kept in the config.json file. For those of you new to ASP.NET Core, you are no longer able to access configuration values statically (more information about this, see my post ASP.NETCore: User Secrets, Secret Manager and External Logins, oh my!). To get at configuration values in your code, you need to inject IOptions into the class that needs the configuration values where T is a strongly typed configuration class that “wraps” the values in config.json (for more information on strongly typed configuration classes in ASP.NET Core, please see this post). I created a strongly typed configuration class to wrap the values in config.json for the Twitter provider. But now I had a problem. I then ran the code and the injection worked. But it bothered me that I was passing in a dependency to the factory class that was only being utilized by one of the providers. That seemed to be a bit of a “wonky” workaround, but the code I had at this time worked. This solution ended up breaking down when through further refactoring, I had to add another dependency to TwitterExternalUserInformationProvider. But this time, I needed to scope the dependency as a transient. In short, TwitterExternalUserInformationProvider was doing a lot of work. Upon closer inspection, I saw this class was violating SRP. I really felt the friction with the class when I went to write a unit test and found I could not write it because of the hard dependency on LinqToTwitter. As with most things in software development, adding another layer of abstraction helped me remove the LinqToTwitter dependency out of TwitterExternalUserInformationProvider. I did this by creating an abstraction for LinqToTwitter and moving the implementation to a separate class. Much better! I was no longer violating SRP. But now I faced the challenge of how to get a transient instance of ITwitterRepository injected into TwitterExternalUserInformationProvider. I initially set out to inject it via ExternalUserInformationProviderFactory (like I did for IOptions) and then pass it to the instantiation of the twitter provider, but the ITwitterRepository needed to be scoped as transient and my factory was scoped as a singleton. How was I going to provide a transient scoped dependency to a class that itself, was also being instantiated by the container, but scoped as singleton? The encapsulation of the LinqToTwitter code in TwitterRepository was the right thing to do, but I needed a mechanism that could resolve the correct type at run-time that did NOT rely on a singleton scoped factory. What I needed was a way for the container to resolve the correct provider instance at run-time instead of my singleton-scoped factory class creating the instances. I started to poke around to see how this could be accomplished and discovered I could inject Autofac’s IComponentContext into the factory. I was no longer injecting dependencies into the factory that were being used by only the TwitterExternalUserInformationProvider and I was no longer instantiating the providers. Autofac was doing the work for me. Note the registration of ExternalUserInformationProviderFactory. It uses Resolve to give itself an instance of IComponentContext. I ran the code, and it worked. After stepping back and taking a look, it dawned on me that my factory code was now using Service Locator. I again, set out to see if there was a way to make this better. Although the code was running, I could potentially run into scoping issues letting Autofac create the provider instances via IComponentContext. Also, I am using Service Locator here, which isn’t the biggest deal, considering the fact that the factory itself is an abstraction of how to retrieve the correct external login provider. I still didn’t like the fact that I was using Service Locator. After further research through Autofac’s docs and on Stackoverflow, it appears Autofac has a way to get rid of the Service Locator pattern by using IIndex<K,V>. The simplest way to think of IIndex<K,V> is as an IDictionary<K,V>. The “K” represents the name of the provider (in this case, a string that says: “Google”, “Facebook”, etc…) and the “V” is the value to return. In this case, “V” is the correct implementation of IProvideExternalUserInformation interface for the given provider name. Note that the case statements are gone. We instead use a dictionary-based approach via TryGetValue to retrieving the correct provider. Here you can see we’re using “.Named(string providerName)”, where T is the interface implemented by all external login providers and “providerName” is a string that represents the provider (“Google”, “Microsoft”, etc…). Through these registrations along with the use of IIndex<K,V> in the factory class, Autofac figures out the right instance to provide. A nice benefit of this change is when we need to add another provider, we only need to add another line to the configuration instead of opening up the factory code. Although we’re no longer using Service Locator, we have tied our factory to Autofac-specific code (IIndex). Some Composition Root purists my scoff at me here and see this solution as no better than the first solution that injected Autofac’s IComponentContext into the factory, but I beg to differ. The real question to be asked here is not rooted in “best practices”, but “what is a better trade-off”? The answer is since this approach can manage scope better, I choose this approach over the version of the factory using Service Locator. Yes, my factory is still cognizant of the Autofac library, but at least I’m no longer using Service Locator. don’t make implementation choices blindly. Always examine the trade-offs.